The affiant must personally acknowledge and sign the document in the presence of a Nebraska Notary. 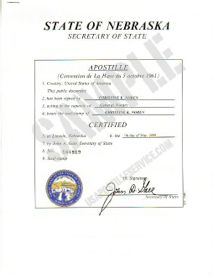 The Notary must properly execute the acknowledgement, oath, or affirmation statement, and affix their stamp and signature. Must be an original document, with original signatures. 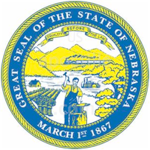 A copy of official transcript of grades or diplomas issued by learning institutions such as high schools and technical, community, public or private colleges can be accepted if photocopied by student and submitted with a properly executed acknowledgement form approved for use in Nebraska.